Private,Peaceful,Updated 2BR Near Storyland! AC,Lg Porch,WiFi & Pets Welcome! Charming, remodeled 2 BR cottage with exposed beams, warm wood floors and cozy gas log stove just 2 min from North Conway village. This home is up a short but steep hill - winter guests should have a vehicle with 4-wheel Drive. Main level: Sparkling kitchen with new stainless steel appliances, open to an intimate dining area. (There's a half bath and mudroom off of the kitchen.) Warm and cozy living room with gas fireplace insert in a beautiful stone chimney, flat screen TV and bookshelf with lots of books and games. 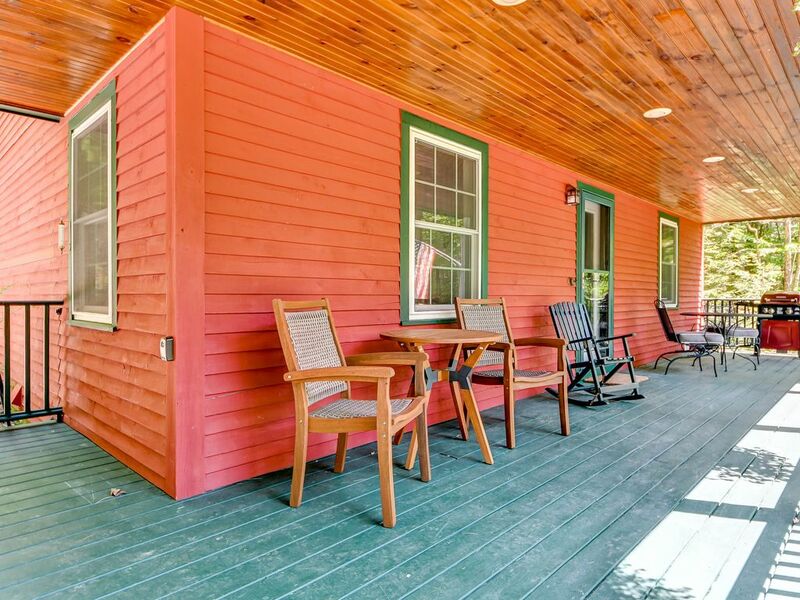 Outside: Large farmer's porch with outdoor dining and seating. Gas grill. *There is an AC unit in each bedroom upstairs and one in the dining room to cool the main level. Nearby Attractions for all seasons: Storyland (5.7 miles), North Conway Scenic Railway, Santa’s Village (46.3 miles), Tax Free Outlet Shopping, horseback riding, hiking, rock climbing, biking, river fishing, swimming, golf, canoeing/kayaking, scenic drives, Mount Washington Auto Rd, moose tours, ziplines, gondola rides, sightseeing, the scenic Kancamagus Highway, downhill skiing at one of the many nearby mountains, cross country skiing, snowmobiling, snowshoeing, tubing, ice skating and sleigh rides. Beautiful house, great location btwn Jackson and North Conway. So close to Cranmore for the skiers. The gas fireplace was fantastic. We would love to stay again. Quiet Christmas getaway close to everything. Family of four vacation over Christmas week. House was as represented, appointed nicely and cute as a button. We had a wonderful stay. Layout gave enough space without being wasteful. All new appliances and well appointed kitchen, dining and living room warmly and cozily decorated. Those nice tall beds and very comfortable mattresses, bedroom furnishings sparse but effective with closet hanger space. House heating was great and the gas fireplace was easy to use and made both plenty of extra heat and great ambiance. Like other vacation homes we have stayed at the tank less hot water heater provided excellent hot water although it takes an extra 10 seconds to get to the faucet. WiFi, TV, bluetooth BOSE speaker all in good working condition. The "take some / leave some supplies" were generous and house books and games were varied and plentiful. Gas grill and snow shovels and salt/ sand all within easy reach on porch. Front yard is steep enough to sled. Rental agency gave us a special warning about the steep paved driveway (before our agreement to rent) and we had no trouble getting up and down even in the rain with just snow tires on a 2WD minivan but with only a few inches of snow and sleet made getting down or up not possible until the plow guy came in the early afternoon to clear the snow. Plow serviceman very helpful and came back as temp. dropped and sanded and gave us a card to reach him if we needed more sanding or had any issues. Location is very close to Cranmore and 5 minutes drive from North Conway main street. Fun small park in the neighborhood, within 2 min. walking distance, had a small skating pond, sledding hill, and even nice chat with some of the neighbors walking their pets. Pinkham Vacation Rental, the group that manages the property, were a delight to interact with and proactively sent information for the check in/ out / plowing etc. provided prompt responses, solutions, and help to all questions including arranging a fix to a non essential minor leaking pipe in the basement discovered upon our arrival. Thank you very much for staying with us! We're extremely happy you had such a nice stay and that the house and service added to your vacation! The beds were comfortable and new. The place was very clean and nice. The photos matched the actual places condition. Place had everything needed, such as dishwasher soap and laundry soap. We had a very nice stay. Thank you for staying with us - have a wonderful summer! The house is in a great location, quiet and we'll kept. Definitely smells like dog though. If that bothers you (as it does me) this isn't the place for you. We're glad to hear that you enjoyed the home and location, and hope that you had an excellent vacation! If you ever encounter an issue when staying with us in the future, please let us know right away and we will do what we can to help address the issue. Had a stellar time at this rental. House was cozy, and located a comfortable distance from my favorite mountain. The house was clean and plenty spacious to accommodate my friends and I. Look forward to staying here again! Thanks for the great review! Glad to hear that the house was appropriate for your wants and needs. Please consider staying with us again when you are back in the beautiful Mt. Washington Valley. There are lots of things to do here no matter what season it is! Cozy, well appointed home in secluded yet convenient location! We come up to North Conway 3 or 4 times a year with the family and sometimes friends. This vacation was geared towards skiing so wanted to find someplace close to the mountain in good condition for a good value. This home at first seemed a little in the smaller side but turned out to be a great fit. The house is in fantastic condition with renovated baths and kitchen. The wood floors were nice and the gas fireplace kept us cozy. The location was super convenient very close to Cranmore, minutes to town and on the far end of town offering a good escape to head north without battling traffic. The front porch must be amazing in the summer. Partial views of Cranmore and in a nice private location. Everything was great. The house was clean, updated, super comfortable and very cozy. I would definitely recommend this home and hope to be back this summer. Thanks for the great review and for staying with us! It sounds like this location was a great fit for your needs. Please consider staying with us again in the summer so you can enjoy that front porch!